Although packaging might not be one of the classic “4Ps of marketing,” marketers know that packaging is an integral part of the product and promotion. Companies do continuous research to determine the optimum graphics, words, logos, and sizes in order to gain consumers’ awareness and eventual sales. In essence, the package becomes the product and provides the consumer with his first look and emotional appeal of the product. What then happens when the package design is not only removed from the manufacturer’s control, but is also made to be as realistic – in the case of cigarettes, unappealing – as possible? The result for tobacco companies is a dramatic package that clearly illustrates the drastic after-effects of smoking cigarettes. 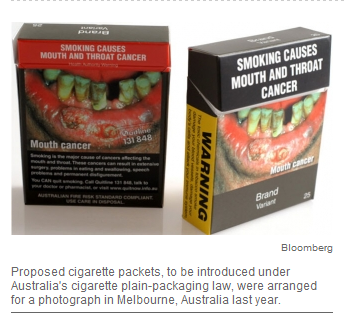 In a recent ruling by the High Court of Australia, the law requires that cigarettes be sold in packages without any company logos, and with the same font for all brands on a dark brown background. In addition, 90% of the package back and 70% of the package front will have graphic health warnings about cigarette smoking. Plan packaging is a significant threat for companies as they will no longer be able to try to differentiate products from competition, and no longer be able to portray cigarettes as an attractive life-style choice. Why such a drastic move by the Australian courts? The country’s government faces more than $31 billion in annual health care costs form smoking and estimates that smoking killed more than 900,000 Australian citizens over the past 60 years. Discuss the importance of packaging for consumer goods products. Divide students into teams. Have each team use laptops to research the packaging and messages used by tobacco companies. Have students team research the tobacco packaging laws in countries such as the U.S., Canada, Australia, New Zealand, and the U.K.
What are the ramifications of the laws for tobacco companies? Poll students: What are attractive packages that they can recall? What are unattractive packages that they can recall? Discussion topics: What are the ethical implications of tobacco advertising? Where is the line between legal compliance and ethical conduct? Research for students: How much do tobacco companies spend on advertising and promotion each year? How much is the health care cost for different countries?